Learn Latin dancing for fun and fitness. No partner required. Couples and singles welcome. Suitable for beginners or anyone with a little experience. Dedicated dance studio in Maroochydore, timber floor, air conditioned comfort. Exclusively for 55+ year olds - Get Out & Get Active! 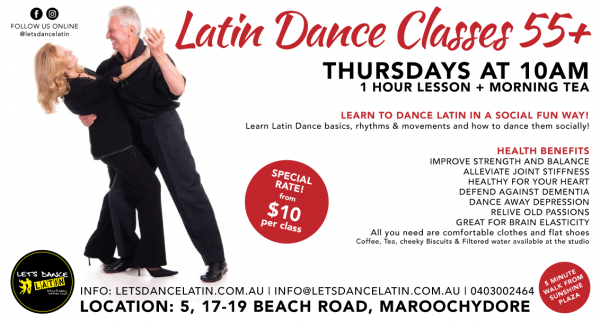 Join us for a Latin Dance Class followed by complimentary morning tea. DANCING HAS MANY HEALTH & SOCIAL BENEFITS!